Home > What’s In Your Water? Some of us take the quality and purity of our tap water for granted. However, the recent news of contaminated drinking water in Flint, Michigan has stirred some nationwide concerns about the state of our public water infrastructure. We need to realize that government is not the end all be all to all of our needs. But, the safety of its citizens should and must be a top priority. We are fortunate to have access to public water in most of Moore County. Those that do not have access to public water typically have a well. Should we be concerned about water quality and safety in our area? Perhaps. Unless we have our water tested, whether public or well, we have no idea if it is safe. There may be excessive levels of chlorine, fluoride, microbes, pesticides, and a host of other contaminants that if ingested may affect our bodies and overall health. According to a study performed by the Natural Resources Defense Council (NRDC), the quality of our tap water is at risk and will continue to worsen if not addressed. The main culprits are obsolete filtration systems, old deteriorating pipes, bacteria, pesticides, jet fuels, industrial chemicals and arsenic to name a few. In a 2009 article titled “U.S. Drinking Water Widely Contaminated” by Taryn Luntz, the author writes about the three-year comprehensive study performed by the The Environmental Working Group (EWG) on the state of the nation’s drinking water. The EWG analyzed over 20 million tap water quality tests from 45 states and discovered 316 contaminants. Ironically, the EPA only regulated 114 of those pollutants at the time. The other 202 chemicals went unregulated. 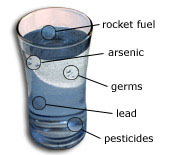 Some of these contaminants included industrial solvents, weed killers, refrigerants and rocket fuels. Without mandatory federal safety standards, there is no way for public governments to address this daunting number of potential toxins. 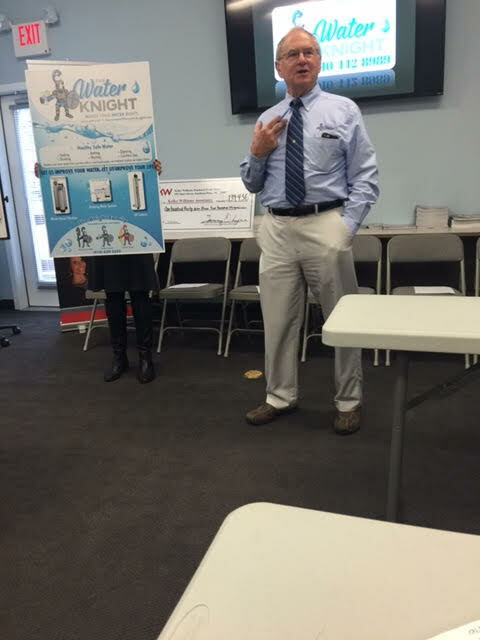 Several weeks ago, Richard Walker, from The Water Knight gave an eye opening presentation to the realtors at Keller Williams Pinehurst about water quality and purity. The presentation touched on the various toxins and contaminants that may be in our drinking water. The facts presented during the presentation prompted me to do a bit of research in order to learn more about the subject. Some of the findings were of great concern and have brought a new sense of awareness to my daily water consumption and further enhanced the knowledge and experience I can now offer my family, friends and real estate clients. We are fortunate to have the services of The Water Knight in our area. One key benefit is a free water analysis of your well or tap water within reasonable driving distance of their office in Pinehurst.The Water Knight is able to evaluate, prescribe, and install state-of-the-art filtration systems to improve your water and your overall health. For more information, visit http://www.thewaterknight.com.